This is a miniaturized version of my Mickey Mouse pattern. This will be the beginning of a series of miniaturized versions of the iconic Disney characters like Minnie Mouse, Donald Duck, Daisy Duck, Goofy, and Pluto. Worsted weight yarn: Black, buff, white, yellow, and red. Rd 5: sc in next sc, (sc2tog) 4 times, sc in next sc. (6) Change to black. BEGIN STUFFING LEGS FIRMLY. CONTINUE STUFFING LEGS FIRMLY AS YOU GO ALONG. Rd 5: (sc2tog) twice, sc in next 4 sc. (6) Change to black. BEGIN STUFFING ARMS FIRMLY. CONTINUE STUFFING ARMS FIRMLY AS YOU GO ALONG. Rd 2: 2 sc in next sc, holding next sc on BODY and sc #1 on RIGHT LEG together and working through both thicknesses, sc in next sc, 2 sc in next sc on BODY, holding next sc on BODY and sc #4 on LEFT LEG together and working through both thicknesses, sc in next sc. Rd 10: holding next sc on BODY and sc #1 on LEFT ARM together and working through both thicknesses, sc in next sc, sc in next 5 sc on BODY, holding next sc on BODY and sc #6 on RIGHT ARM together and working through both thicknesses, sc in next 3 sc, sc in next 4 sc on BODY, holding next sc on BODY and sc #3 on LEFT ARM together and working through both thicknesses, sc in next 2 sc, slip st in next sc. Work will finish 1 sc past where the round started. Rd 11: sc in next 5 sc on BODY, sc in next 3 sc on RIGHT ARM, sc in next 4 sc on BODY, sc in next 3 sc on LEFT ARM. STUFF BODY AT THIS POINT. Finish off leaving a long tail. Weave tail through sc of Rd 20, pull tightly and secure. Weave in ends. Rd 5: sc in next 10 sc, change to white, sc in next sc, change to red, sc in next 3 sc, change to white, sc in next sc, change to red, sc in next 9 sc. Finish off. Weave in ends. Repeat in the other Leghole. 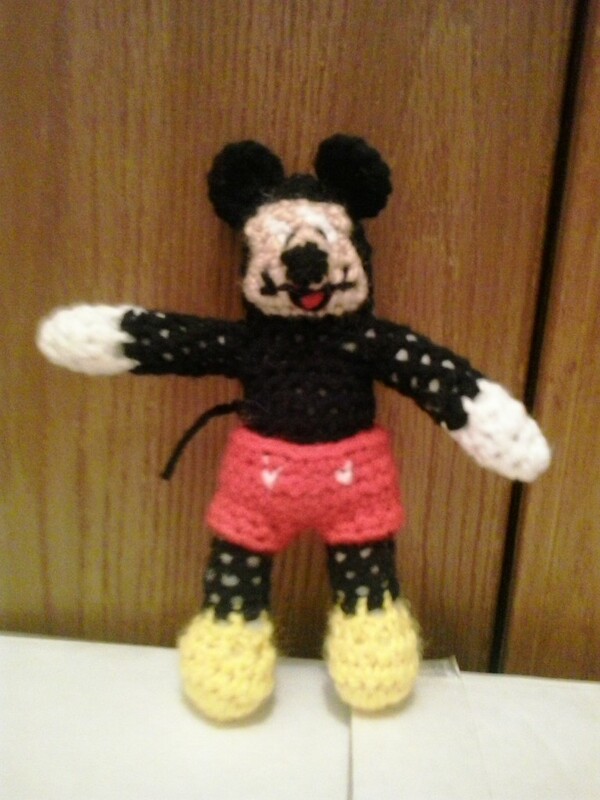 Place SHORTS on LITTLE MICKIE MOUSE and tack stitch in place. With black, ch 10, attach to back above BLOOMERS. Finish off leaving a long tail. Sew FACE to head of BODY. Finish off leaving a long tail. Sew NOSE to FACE. Embroider NOSE, MOUTH, EYES, AND EYELASHES on FACE. Minnie Mouse, Mickey Mouse, Donald Duck, Daisy Duck, Goofy, and Pluto are copyright Walt Disney Co. and their respective creators. This crochet pattern is an original pattern and is © by Christjan Bee (May 2018). Please do not claim this pattern as your own. If you wish to share this pattern, you may link to this pattern but please do not reprint/repost it on your site. You may print and keep a copy for your own personal use, but you may not sell or distribute it, or sell items made from this pattern.